This training page is for all contributors who may not currently have WordPress web publishing experience. You soon will be a pro! Non members may learn from this site but you can not post articles without permission of the site owner or Editor. 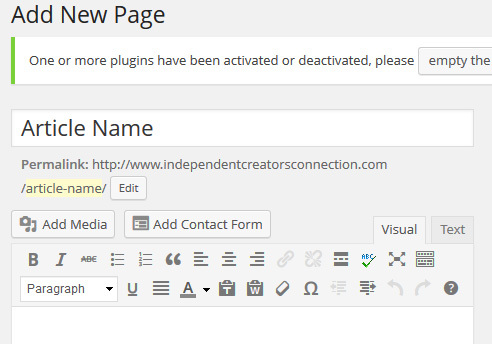 Editors and contributors, take note: Creating stunning articles in WordPress is easy. It takes a little bit of practice. Click on the image below for easy reference. 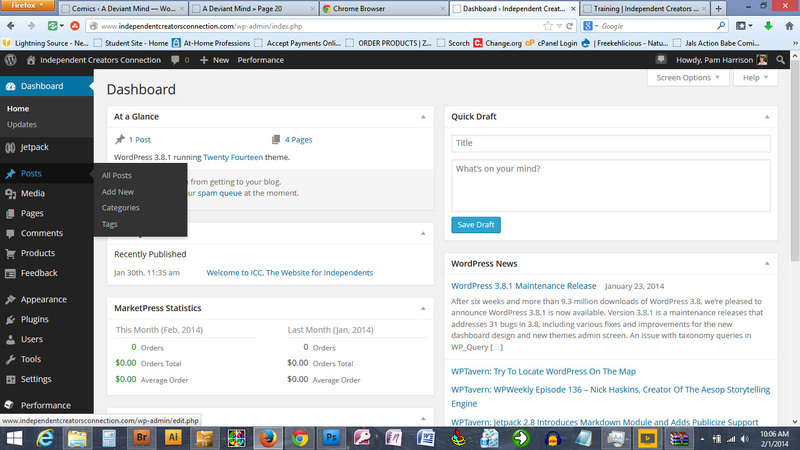 To start work on an article, on the Dashboard you go to Posts, and select Add New. You will want to name your article immediately. WordPress has an automatic feature called Permalink that creates a link to your article so that you don’t have to save anything to your desktop or navigate your website to find. IF you first created your article in Word, the little clipboard above with the W on it allows you to copy and paste from Word. The one on the left with the T is paste from text. Simply copying and pasting from Word leaves formatting code, and makes a big mess. Then take a look at your other features. 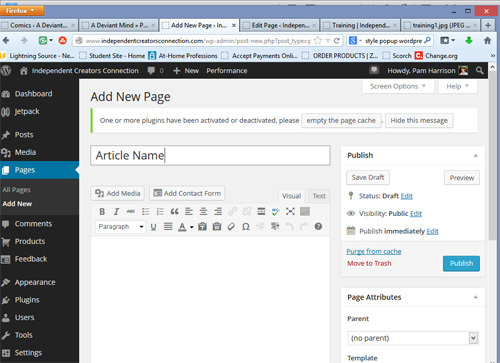 Page: On the right hand side of the page you have your controls like Publish, Format, and Featured Image. On the Publish section you can see the status of your article, whether to make it Public, Password Protected, or Private, viewable only to other members of the site. You can also see the number of revisions and when the article is published. Format is the kind of post you are creating. A standard article is a standard article. An aside is a commentary on something, and the rest kind of speaks for itself. Experiment with the Gallery format, as none of us have used it yet and it might be even cooler than we thought. Categories: All articles will fall under one or more categories. Typically they will be blogs from the site owner with updates, Articles by contributors, or specific posts on specific topics. 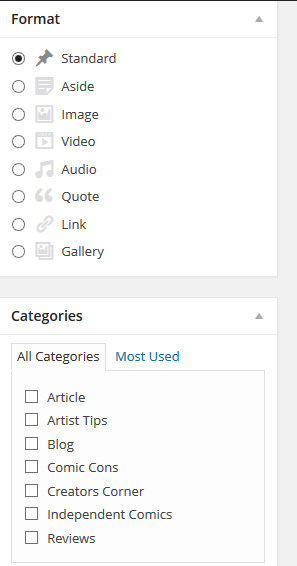 More categories can be created, but keep the list specific so readers can find your stories in the archives. Last but not least is Featured Image > Set featured image which I have done with one of my comic covers for this article, at the top of this page. The Featured Image is there so anyone can post comic pages for readers without getting heavy into Comic Press and other themes for strictly comic sites. Images: You can upload images to insert in your articles! Images strictly for an article should ideally be no more than 500 pixels wide. You can click on an image and shift/drag the size down just like in Photoshop, or you can go to the top of the page where the Visual/Text tabs are and click Text. Then you can search for your images and delete the Height code, leaving only the wide. WordPress will automatically resize your image in the finished post. And you DON’T HAVE TO RE-UPLOAD THE SAME IMAGE OVER AND OVER! The awesome Media Library keeps all your images at hand, and if you delete an image, just reinsert it. 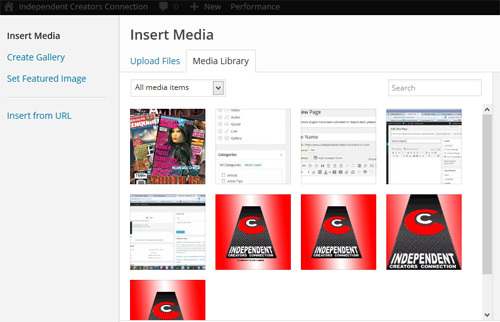 Go to Add Media, look in the Media Library til you find the image you want, and Insert Into Post. For brand new images, select Upload Files. You can also schedule your posting times for best viewing, to make sure your post reaches as many people as possible. Internet “prime time” spans from approximately 9 p.m to 1 a.m. around the world. This contrasts with broadcast TV prime time, which is generally from 7 p.m. to 11 p.m. across most global markets. And since now countless people stream television and social media content online via computer, laptop or cellphone, you can shoot for both. Happy article writing! It’s going to be awesome to see how this site grows. If you have any more questions, just post them in the Comments box below.